Itamar Turner-Trauring: Can software engineering be meaningful work? The world is full of problems-from poverty to climate change-and it seems like software ought to be able to help. And yet your own programming job seems pointless, doing nothing to make things better. Far too many jobs are just about making some rich people just a little bit richer. There are no easy answers, but here's a starting point, at least. Of course, most software jobs aren't evil, but neither are they particularly meaningful. You can help an online store come up with a better recommendation engine, or optimize their marketing funnel, or build a web UI for support staff-but does it really matter that people buy at store A instead of store B? So it's worth thinking in detail about what exactly it is you would find meaningful, and seeing if there's work that matches your criteria. There may not be a huge number of jobs that qualify, but chances are some exist. You may not be able to find such a job, or get such a job. So there's something to be said for not making your work the center of your life's existence. Make the world a better place, just a little: I've been volunteering with a local advocacy group, and the ability to see the direct impact of my work is extremely gratifying. Beauty and nature: Programming as a job can end up leaving you unbalanced as a person-it's worth seeing the world in other ways as well. Creation for creation's sake: Many of us become programmers because we want to create things, but having a job means turning to instrumental creation, work that isn't for its own sake. Try creating something not for its utility, but because you want to. Find people who understand you: Being part of a social group that fundamentally doesn't match who you are and how you view the world is exhausting and demoralizing. I ended up moving to a whole new country because of this. But if you live in a large city, quite possibly the people who will understand you can be found just down the block. Unless you want to join a group that will tell you exactly what to think and precisely what to do-and there are certainly no lack of those-meaning is something you need to figure out for yourself. It's unlikely that you'll solve it in one fell swoop, nor is it likely to be a fast process. The best you can do is just get started: a meaningful life isn't a destination, it's a journey. If you're not careful you can end up setting unreasonable expectations, and ending up tethered to your work email and Slack. Your manager will expect you to work weekends, and your teammates will expect you to reply to bug reports in the middle of your vacation. What you want is the opposite: when you're at home or on vacation, you should be spending your time however you want, merry and free. You need to set boundaries, which is what I'll be discussing in the rest of this article. Imagine you're starting a new job in a week, you enjoy programming for fun, and you want to be productive as soon as possible. Personally, I wouldn't do any advance preparation for a new job: ongoing learning is part of a programmer's work, and employers ought to budget time for it. But you might choose differently. If so, it's tempting to ask for some learning material so you can spend a few days beforehand getting up to speed. But you're failing to set boundaries if you do that, and they might give you company-specific material, in which case you're just doing work for free. Learning general technologies is less of a problem-knowing more technologies is useful in your career in general, and maybe you enjoy programming for fun. So instead of asking for learning material, you can go on your own and learn the technologies you know they use, without telling them you're doing so. When you do engage, you'll be setting expectations that you're available to answer questions 24/7. While you're at work you'll always have your computer, so you don't need access on your phone. If you do need to set up work email on your phone for travel, remove the account when you're back home. And if you want to have your work calendar on your phone, you can share it with your personal calendar account; that way you're sharing only your calendar, nothing else. When you're on vacation, you're on vacation: no work allowed. That means you're not taking your work laptop with you, or turning it on if you're at home. A week or so in advance of your vacation, explain to your team that you won't be online, and that you won't have access to work files. Figure out what information they might need-documentation, in-progress work you want to hand off, and the like-and write it all down where they can find it. A standard workweek in the US is 40 hours a week; elsewhere it can be a little less. Whatever it is, outside those hours you shouldn't be working, because you're not being paid for that work. Your evenings, your weekends, your holidays, your vacations-all of these belong to you, not your employer. If you don't enforce that boundary between work and non-work, you are sending the message that your time doesn't belong to you. And if you have a bad manager, they're going to take advantage of that-or you might end up working long hours out of a misplaced sense of obligation. So unless you're dealing with an emergency, you should forget your job exists when your workday ends-and unless you're on your on-call rotation, you should make sure you're inaccessible by normal work channels. The answer, of course, is that you can't learn them all-in depth. What you can do is learn about the tools' existence, and learn just enough about them to know when it might be worth learning more. Quite often, spending 5 minutes learning about a new technology will give you 80% of the benefit you'd get from spending 5 days on it. The problem with becoming an expert is that it's time consuming, and you don't want to put that level of effort into every new tool you encounter. Some new technologies will die just as quickly as they were born; there's no point wasting time on a dead end. Most technologies just aren't relevant to your current situation. GitHub keeps recommending I look at a library for analyzing pulsar data, and not being an astrophysicist I'm going to assume I can safely ignore it. If you try to spend a few days-or even hours-on every intriguing new technology you hear about, you're going to waste a lot of time. Most of the time you don't actually need to use new tools and techniques. As long as you know a tool exists you'll be able to learn more about it when you need to. For example, there is a tool named Logstash that takes your logs and sends them to a central location. That's pretty much all you have to remember about it, and it took you just a few seconds to read that previous sentence. Maybe you'll never use that information… or maybe one day you'll need to get logs from a cluster of machines to a centralized location. At that point you'll remember the name "Logstash", look it up, and have the motivation to actually go read the documentation and play around with it. This is also true when it comes to finding a new job. I was once asked in a job interview about the difference between NoSQL and traditional databases. At the time I'd never used MongoDB or any other NoSQL database, but I knew enough to answer satisfactorily. Being able to answer that question told the interviewer I'd be able to use that tool, if necessary, even if I hadn't done it before. Learning about the existence of tools can be a fairly fast process. And since this knowledge will benefit your employer and you don't need to spend significant time on it, you can acquire it during working hours. You're never actually working every single minute of your day, you always have some time when you're slacking off on the Internet. Perhaps you're doing so right now! You can use that time to expand your knowledge. A great way to learn new tools and techniques are weekly email newsletters. There are newsletters on many languages and topics, from DevOps to PostgreSQL: here's one fairly detailed list of potential newsletters you can sign up for. But you don't have to go to the conference or Meetup to benefit, or even watch a recording of the talks to learn something. Just skimming talk topics will give you a sense of what the community is talking and thinking about-and if something sounds particularly relevant to your interests you can spend the extra time to learn more. Of course, if you can convince your employer to send you to a conference that's even better: you'll learn more, and you'll do it on the company's dime and time. I'll be going to [a coding boot camp]. [After I graduate], my current view is to try hard to negotiate for whatever I can and then get better for my second job, but both of those steps are based on the assumption that I understand what an acceptable range for pay, benefits, etc are, and I feel like it's leaving money (or time) on the table. I'm not even sure if entry level jobs should be negotiated since they seem to be such a commodity. Do you have any advice for someone standing on the edge of the industry, looking to jump in? Don't think of yourself as a commodity-you're just undermining yourself. Don't present yourself as a commodity-it's bad marketing. You are not a commodity-because no one is. This is perhaps more obvious if you have lots of experience, but it's just as true for someone looking for their first job. We all have different strengths, different weaknesses, different experiences and background. So when it comes to finding a job, you should be highlighting your strengths, instead of all the ways you're the same as everyone else. In the rest of this article I'll show just a few of the ways this can be applied by someone who is switching careers into the tech industry; elsewhere I talk more about the more theoretical side of marketing yourself. Since employment is a negotiated relationship, negotiation starts not when you're discussing your salary with a particular company, but long before that when you start looking for a job. If you're going to a coding bootcamp chances are you've had previous job experience. Many of those job skills will translate to your new career as a software developer: writing software as an employee isn't just about writing code. And if you can apply to jobs where your business knowledge is relevant, even better: if you used to work in insurance, you'll have an easier time getting a programming job at an insurance company. Research salaries in advance. There are a number of online salary surveys-e.g. StackOverlow has one-which should give you some sense of what you should be getting. Keep in mind that top companies like Google or some of the big name startups use stock and bonuses as a large part of total compensation, and salary doesn't reflect that. Glassdoor has per-company salary surveys but they often tend to be skewed and lower than actual salaries. Try to apply to multiple jobs at once, and not to say "yes" immediately to the first job offer you can get. If you can get two offers at the same time, chances you'll be able to get better terms from one or the other. In fact, even just saying "I'm in the middle of interviewing elsewhere" can be helpful. Notice how all of the suggestions above aren't about that final conversation about salary. There's a reason: by the time you've reached that point, most of the decisions about your salary range have already been made. You still need to ask for more, but there's only a limited upside at that point. So it's important to present your unique strengths and capabilities from the start: you're not a commodity, and you shouldn't market yourself like one. You're looking for a new job, or feel like it's time for a raise, or maybe you just want to set some boundaries with your boss. And that means negotiating, and you hate the whole idea: asking for things is hard, you don't want to be treated specially, the idea of having the necessary conversation just makes you super-uncomfortable. And that's a problem, because you can't avoid negotiating: employment is a negotiated relationship. From the minute you start looking for a job until you leave for a new one, you are negotiating. And maybe you didn't quite realize that, and maybe you didn't ever ask for what you want, but in that case you're still negotiating. You're just negotiating badly. To see why, let's take the example of a job search, and see how the final conversation where you discuss your salary is just a small part of the real negotiation. Companies tend to have different job titles based on experience, with corresponding ranges of salaries. Your salary is determined first by the prospective job title, and second by the specific salary within that title's range. When you send in your resume the HR or recruiting person who reads it puts you into some sort of mental bucket: "this is a senior software engineer." The interview process then hardens that job title, and gives the company some sense of how much they want you and therefore where in that title's salary range to put you. That final step, the awkward conversation we tend to think of as the negotiation, is only the end of a long process. By the time you've reached it much of your scope for negotiation has been restricted: you'll have a harder time convincing the company you're a Software Engineer IV if they've decided you're a Software Engineer II. You can ensure you've demonstrated your correct level of problem-solving skills in your resume. If you can identify problems, it's very easy to give the impression you can only solve problems if you don't phrase things right ("I switched us over from VMs to Kubernetes" vs. "I identified hand-built VMs as a problem, investigated, chose Kubernetes, etc."). All of these-and more-are part of the negotiation, long before you get the offer and discuss your salary. Yes, you do need to ask for what you want at the end. And yes, that's going to be scary and awkward and no fun at all. But asking for things is something you can practice in many different contexts, not just job interviews. But if you treated the whole job interview process as a negotiation, that final conversation will be much easier because the company will really want to hire you-and because they'll be worried you'll take that other job offer you mentioned. You're not done negotiating when you've accepted the offer, though. When your boss asks you to do something, you don't have to say yes. In fact, as a good employee it's your duty not to say yes, but to listen, dig a little deeper, and find the real problem. Similarly, how many hours you work is not just up to your boss, is also about how you push back on unreasonable demands. And again, it's your duty as a good employee to push back, because work/life balance makes you a better software engineer. When you're searching for a new programming job you want to avoid companies with long work hours. You can ask about work/life balance during the interview (and unless you're desperate, you always should ask), but that means wasting time applying and interviewing at companies where you don't want to work. What you really want is to only apply to companies that actually allow-or even better, encourage-good work/life balance. Close reading of the job posting and company hiring pages can sometimes help you do that, but some good companies don't talk about it, and some bad companies will just lie. So in this article I'll explain how you can use GitHub to empirically filter out at least some companies with bad work-life balance. If you go to the profile for a GitHub user (here's mine) you will see a chart showing contributions over time. The columns are weeks, and each row is a day of the week. What's most interesting here are the first and last rows, which are Sundays and Saturdays respectively. 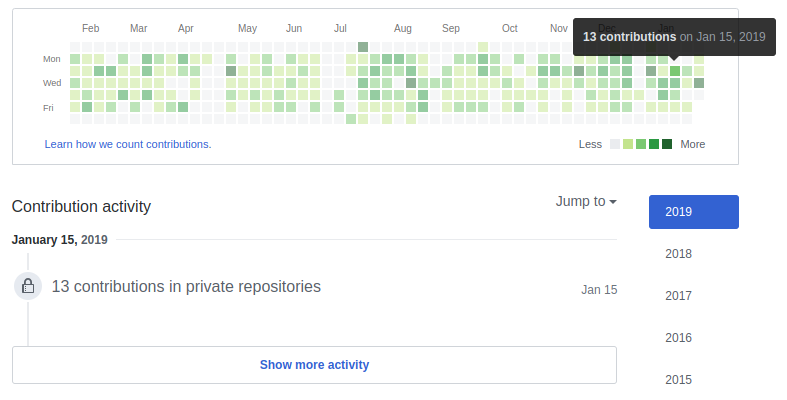 As you can see in the image above, this GitHub user doesn't tend to code much on the weekends: the weekend boxes are mostly blank. On the other hand, if you were to click on the weekend boxes you would see that all the weekend contributions are to open source projects. In short, this user doesn't code much on the weekend, and when they do it's on personal open source projects, not work projects. Generalizing this process will allow you to filter out companies that don't have work/life balance for developers. This is a relatively small company; large companies tend to vary more across groups, so you'll need to adjust the process somewhat to focus on programmers in the group you're applying to. This is not a perfect process, since users can disable showing private repository contributions, or it's possible the developer has personal private repositories. This is why you want to check as many profiles as possible. Find a number of programmers who work for the company. You can do this via the company's website, and by the company's page on LinkedIn, which will list employees who have LinkedIn profiles. You can also check for members of the company's GitHub organization, if they have a public list, but don't rely on this exclusively since it will likely omit many employees. For each programmer, use your favorite search engine and search for "$NAME github" to find their GitHub profile. Try to do some sanity checks to make sure it's the right person, especially if they have a common name: location, organization membership, technologies used, etc..
For each programmer, check if they contribute to private repositories during the week. You do can this by visually seeing if there are lots of green boxes, and by clicking on the Monday-Friday boxes in the timeline and reading the results below. If they mostly don't, the company might not use GitHub. Look for correlated weekend work dates across different people: if 5 people are working on private repos on the same 4 weekends, that's probably a sign of crunch time. By the end of the process you will often have a decent sense if most of the programmers are coding on the weekend. Note that this method can only tell you if they don't have work/life balance-you still can't know if they do have work/life balance. Before you apply for a job you should always do your research: read their website, reads all their job postings, talk to a friend there if you have one… and as I explained in this article, their GitHub profiles as well. You'll still need to look for warning signs during interviews, but research is still worth it. The more you research, the more you'll know whether you want to work there. And if you do want to work there, the more you know there better your interview will go. You're dreaming of a programming job with 30 hours a week, a job where you'll have time for your own projects, your own hobbies. But this sort of job seems practically non-existent-almost no one advertises programming jobs with shorter workweeks. The ideal would be some company or employer where you just can ask for a shorter workweek, without having to apply or interview, and have a pretty good chance of getting a "yes". In this post I'll talk about the easiest way to get what you want: negotiating at your current job. as an existing employee you are much more valuable than an equally experienced programmer who doesn't work there. During your time at your employer you have acquired a variety of organization-specific knowledge and skills. It can take quite a while for a new employee to acquire these, and during the ramp-up period they will also take up their colleagues' time. Not only do you have hard to-replace skills and knowledge, you also have your work record to build on: your manager knows what you can do. Once you've been working for a manager for a while they'll know your skills, and whether they can trust you. After a number of years working as a software engineer for one company, I got a bad case of RSI (repetitive strain injury). I could no longer type, which meant I could no longer work as a programmer. But I did stay on as an employee: one of the managers at the company, who I'd worked for in an earlier role, offered me a position as a product manager. In part this was because the company was run by decent people, who for the most part took care of their employees. But it was also because I had a huge amount of hard-to-replace business and technical knowledge of the company's product, in a highly complex domain. I worked as a product manager for a few years, but I never really enjoyed it. And with time my hands recovered, at least partially, potentially allowing me to take up programming again. After my daughter was born, my wife and I decided that I'd become a part-time consultant, and take care of our child the rest of the time, while she continued working full-time. My manager was upset when I told him I was leaving. I felt bad-but really, if your boss is unhappy when you're leaving, that's a good thing. In fact, my boss offered to help me find a less-than-full-time programming position within the company so I wouldn't have to leave. I'd already made up my mind to go, but under other circumstances I might have taken him up on the offer. Notice how I was offered reduced hours, even though companies will never advertise such positions. That's the value of being an existing employee. Unless you work for a really bad manager-or a really badly managed company-a reasonable manager would much prefer to have your experience for 4 days a week than have to find a train a replacement. That doesn't mean they'll be happy if you ask for a shorter workweek: you are likely to get some pushback. But if you have a strong negotiating position-financial savings, valuable work, the willingness to find another job if necessary-there's a decent chance they will eventually say "yes". Much of this article was an excerpt from my book, Negotiate a 3-Day Weekend. It covers everything from negotiation exercises you can do on the job, to a specific script for talking to your boss, to negotiating at new employers if you can't do it at your current job. You're applying for jobs, you're hoping to get an offer soon-and when you do you'll have to face the scary issue of negotiation. If you read a negotiation guide like Valerie Aurora's HOWTO (and you should!) you're told you need to negotiate: you need to ask for more. And that's good advice. The problem is that asking for more is scary: it feels confrontational, your body will kick in with an unhelpful adrenaline surge, it's just not comfortable. And honestly, given you only negotiate your salary every few years, that adrenaline surge probably isn't going to go away. But I think you can get past that and negotiate anyway-by embracing your inner 6-year old. In particular, a 6-year old negotiating for snacks on a playdate. A 6-year old named Emma is visiting her friend Jackson, and now it's time for a snack. Jackson's parent-Michael-now needs to feed Emma. Michael would prefer the children not eat crackers, but he has a problem. Michael has some authority over Jackson since he's his parent, and some knowledge of what Jackson is willing to eat. So he can say "you're eating one of these mildly healthy snacks" and that's the end of it. Michael: "Would you like some fruit?" Michael: "How about same cheese?" Michael has committed to feeding Emma something, he doesn't want her to go hungry-but he doesn't have the normal leverage he has as a parent. As a result, Emma can just stall until she gets what she wants. Particularly enterprising children will ask for candy (even when they would never get candy at home! ), but stalling seems well within the capacity of most 6-year olds. Whoever is making the offer-HR, an internal recruiter, or the hiring manager-has already committed to hiring you. They've decided: they had interviews and meetings and they want to get it over with and just get you on board. So they come up with an acceptable salary range, and offer you the low end of the range. If you accept that, great. And if you say "can you do better?" Well, they've already decided on their acceptable salary range: they'll just move up within that range. They're not insulted, they're used to this. They're not horrified at a hole in their budget, this is still within their acceptable range. You can influence this by the language on your resume, by how you present yourself, how you interview, and by noting you have competing offers. It may not feel like negotiation, but it's all part of the process-and while it's a set of skills you can master as an adult, that part is far beyond what your 6-year old self could do. But the actual conversation about salary? Pretend you're 6, pretend it's a snack, and ask for more-chances are you'll get some delicious crackers. Itamar Turner-Trauring: Competing with a "Stanford grad just dying to work all nighters on Red Bull"
It seems like us software engineers are in a tough spot: companies demand a lot of hard work and long hours, and due to the competitiveness here in Silicon Valley, you have to go along with it (or else there's some bright young Stanford grad just dying to work all nighters on Red Bull to take your place). But they throw you aside once the company has become established and they no longer need the "creative" types. In short, how do you get a job with work/life balance when you're competing against people willing to work long hours? The starting point is realizing that working long hours makes you a much less productive employee, to the point that your total output will actually decrease (see Evan Robinson on crunch time). If you want to become an effective and productive worker, you're actually much better off working normal hours and having a personal life than working longer hours. Just because you're a valuable, productive programmer doesn't mean you're going to get hired, of course. So next you need to find the right company. Level 2: These managers can recognize effective workers, but don't quite know how to create a productive culture. That means if you choose work long hours they won't stop you, however pointless these long hours may be. But, they won't force you work long hours so long as you're doing a decent job. When you look for a job you will want to avoid Level 1 managers. However good your work, they will be happy to replace you with someone incompetent so long as they can get more hours out of them. So you'll be forced to work long hours and work on broken code. Level 3 managers are ideal, and they do exist. So if you can find a job working for them then you're all set. Level 2 managers are probably more common though, and you can get work/life balance working for them-if you set strong boundaries. Since they can recognize actual competence and skills, they won't judge you during your interview based on how many hours you're willing to work. You just need to convey your skill and value, and a reasonable amount of dedication to your job. And once you've started work, if you can actually be productive (and if you work 40 hours/week you will be more productive!) they won't care if you come in at 9 and leave at 5, because they'll be happy with your work. Unlike Level 3 managers, however, you need to be explicit about boundaries during the job interview, and even more so after you start. Elsewhere I wrote up some suggestions about how to convey your value, and how to say "no" to your boss. To put all this another way: employment is a negotiated relationship. Like it or not, you are negotiating from the moment you start interviewing, while you're on the job, and until the day you leave. Level 1 managers you can't negotiate with, because what they want (long hours) directly conflicts with what you want. Level 3 managers will give you what you want without your having to do anything, because they know it's in the best interest of everyone. Automated tests are immensely useful. Once you've started writing tests and seen their value, the idea of writing software without them becomes unimaginable. But as with any technique, you need to understand its limitations. When it comes to automated testing-unit tests, BDD, end-to-end tests-it's tempting to think that if your tests pass, your software is correct. But tests don't, tests can't tell you that your software is correct. Let's see why. Identification: Figure out what the problem is you're trying to solve. You might create a specification that doesn't match the solution. You might write code that doesn't match the specification. Automated tests are also a form of software, and are just as prone to error. The fact that your automated tests pass doesn't tell you that your software is correct: you may still have identified the wrong problem, or chosen the wrong solution, and so on. From the code's perspective-the perspective of an automaton with no understanding-the correct answer of 4 is the one that will cause it to fail. But merely by reading that you can tell it's wrong: you, the human, are key. While passing tests can't prove correctness, the process of writing tests and making them pass can help make your software correct. That's because writing the tests involves applying human judgment: What should this test assert? Does match the specification? Does this actually solve our problem? You write the test above, and then reread it, and then say "wait that's wrong, 2 + 2 = 4". You fix it, and then maybe you add to your one-off hardcoded tests some additional tests based on core arithmetic principles. Correctness comes from applying the process, not from the artifacts created by the process. Because tests ensure stability. once we judge the software is correct, the tests can keep the software from changing, and thus reduce the chances of its becoming incorrect. The tests are never enough, because the world can change even if the software isn't, but stability has its value. Don't mistake passing tests for correctness: you will likely need additional processes and techniques to achieve that.